How do you know when it’s been a bad year for the movies? Answer: when you have to narrow down a field of the year’s worst. There were WAY too many candidates for this 2010’s worst of the year; I had to whittle down from a list of 20 to get an ultimate 10. You’ll notice that “I Am Love” is absent from this list despite me giving it a flat F, and that’s because I saw it way back in 2009. So enjoy – or cringe – this list of movies so bad, they don’t even get a snide remark under the picture. They just get linked back to my review from earlier in the year when I totally trashed them. Take the time to look at the reviews if you need convincing – I think I write my best stuff when I’m mad as #&*$ writing a bad review. Currently sitting at an impressive 9% fresh rating at Rotten Tomatoes (50% better than better than “The Last Airbender,” if you’re looking for a comparison), the movie still looks to drain the most money out of the pockets of holiday moviegoers. This isn’t going to drive them away, or me away, for that matter. I accept the fact that it could be horrific with open arms in the hopes of sharing a fun, laughter-filled evening with an auditorium full of total strangers. But that 9% doesn’t exactly reassure me. Does it ultimately affect me? No, but it makes an impact, especially for movies that I’m on the fence about seeing. Case in point: “Burlesque,” which made a really poor critical showing. I skipped it as a result. You’ve almost assuredly heard all the bad buzz surrounding “The Last Airbender.” And yes, it’s pretty bad. But don’t let the 9% fresh rating on Rotten Tomatoes convince you that this some sort of cataclysmic flop. It’s no worse than any of the other mindless, soulless blockbusters that studios engineer to turn our suffering into their profit. Everything suffers from Shyamalan’s ignorance. His script is unimaginative and dull. Simply put, he just cannot handle themes or dialogue. The plot does move, although at the pace of molasses sliding down a mountain. It’s no simple task to dumb down genocide, but Shyamalan does it with ease (and that’s not a compliment). The acting is all pretty laughable, even Dev Patel (for whom I yelled “JAMAL!” upon seeing). I normally don’t think ethnic casting too big of an issue, but it did bug me that the three leads were white and everyone else was Indian. 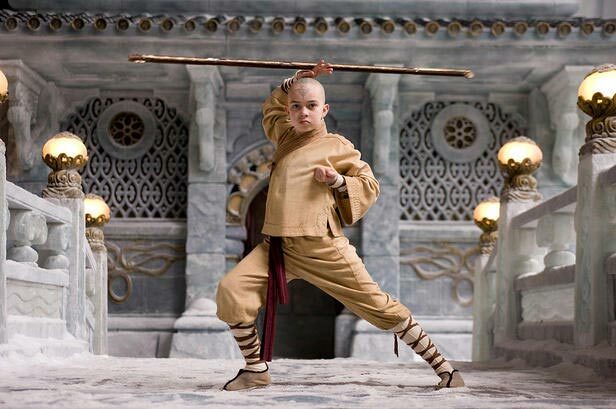 Unfortunately, the worst among the ranks is Noah Ringer, who plays top dog Aang thanks to his discovery at an open casting call. Apparently, they weren’t looking for anyone with any talent or acting skills. You could have stuck one of the E-Trade babies in the movie and gotten a more emotionally compelling and appropriate performance. Never did I think I would see the day when I would pine for models turned actors, but watching “The Last Airbender” made me do just that. People are already calling summer 2010 one of the worst seasons in history. Ouch. Does July hold anything in store to turn the tide late in the game? Let’s take a look. M. Night Shyamalan give us his most mainstream movie yet with “The Last Airbender.” Due to James Cameron’s mildly successful film “Avatar,” the Nickelodeon series opted to use only the last part of its name to avoid confusion (although you could make some good money from dumb moviegoers under the impression they’re seeing “Avatar 2”). It got the quickie 3D conversion slapped on in the past months, which means I’m sticking to 2D here if I even see it at all. I’m worried that some backlash against the conversion could wind up really hurting this movie. But even before I knew about the added dimension, I couldn’t get myself too excited. No matter how extravagant and enormous they make it look, it’s still a Nickelodeon series. I have mixed feelings for Shyamalan; the only movie of his I actually liked was “The Sixth Sense.” I don’t know anyone in the cast save for Dev Patel, better known as Jamal Malik from “Slumdog Millionaire,” and he may end up being what draws me in to see it. Sometimes I don’t catch everything when it is initially released, particularly indies. I want to give them their fair shake, so I’m going to feature movies when they open in my hometown if I missed them before. The first of these movies is “Solitary Man” starring Michael Douglas and thank heavens it’s not Michael Cera (that’s code for Jesse Eisenberg). In her glowing review of the movie, Lisa Schwarzbaum of Entertainment Weekly called this, not “Wall Street 2,” Douglas’ best shot for Oscar glory. The story seems friendly enough and the character seems an Oscar type. Rounding out the ensemble are Jenna Fischer (“The Office”), Susan Sarandon, Danny DeVito, and Mary-Louise Parker, so it seems pretty audience friendly too. Adrien Brody steps back into the horror arena after … let’s just say, going places in “Splice.” This time, he’s rebooting the “Predator” franchise along with Laurence Fishburne and Topher Grace. “Predators” proudly flashes the name of producer Robert Rodriguez. But here’s what I want to know – will sequel/reboot/remake fatigue catch up with moviegoers by July and kill this movie? I’m so excited for the release of “Despicable Me.” Not because I want to see it, but because I’m so tired of seeing the stupid trailers with every movie I have seen for the past year. My guess is families will still be choosing “Toy Story 3” over this. Not even Julie Andrews can save a movie that proudly boasts the participation of an executive producer from the “Ice Age” series as if they had Steven Spielberg. Opening in Houston on July 9 is “Restrepo,” the winner of the Grand Jury Prize at Sundance for documentary features. It takes a look at the grittiest and most intense location of fighting in Iraq and its effect on the soldiers who fight there. Inception INCEPTION Inception INCEPTION Inception INCEPTION Inception INCEPTION Inception INCEPTION Inception INCEPTION Inception INCEPTION Inception INCEPTION Inception INCEPTION Inception INCEPTION Inception INCEPTION Inception INCEPTION Inception INCEPTION Inception INCEPTION Inception INCEPTION Inception INCEPTION Inception INCEPTION … AHHHH!!!!! Officially released on June 18 but not hitting Houston until July 16 is “The Killer Inside Me,” starring Casey Affleck and Kate Hudson. Apparently it’s based on one of the most brutally violent and disturbing stories ever. I’ll trust Kubrick here. I’m hoping “Salt” becomes this summer’s “Wanted.” Just an enjoyable, action-packed movie that doesn’t try to wow you, only entertain you. Angelina Jolie makes one BA action heroine … or villain, depending on what happens in this movie. Kiddie fare comes for the third straight weekend with “Ramona and Beezus,” starring Disney Channel sweetheart Selena Gomez. This could do well because it’s an adaptation of the beloved series that has been around for decades, and it has an impressive adult cast including Sandra Oh, Bridget Moynahan, John Corbett, and Josh Duhamel. Then again, it could also just fade into the mist of the other kids movies. Opening on the indie side of things is “Life During Wartime” starring Allison Janney. But what reeks of a stinker even more is “Cats and Dogs: Revenge of Kitty Galore,” a sequel that no one really wants. And “Charlie St. Cloud” reeks of Zac Efron. Meanwhile, there’s some good indie drama with “Get Low,” starring Robert Duvall. See my Oscar Moment for further commentary. Can July save the summer? Will “Inception” rule the roost? What will be the BEST movie of the month? Let me know by taking the poll … DEADLINE IS JUNE 25.